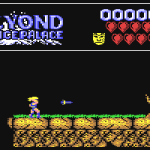 Some of you may have wondered in the past if Beyond The Ice Palace was meant to have been a Thundercats game. Certainly the main character looks the part, albeit with blond hair – so it was fairly plausable. Well you wondered correct! 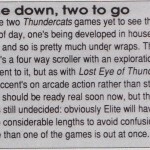 Thanks to Patrick Furlong for originally suggesting, but it seems that according to one of the Amstrad magazines of the time (Amstrad Computer User), the game Beyond the Ice Palace was actually intended to be a Thundercats game for Elite. Nick Jones confirmed to GTW64 that this was the case, and it was to be the second game in a series of three. That’s right … the second game. 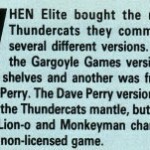 You see, Elite actually commissioned 3 separate teams to produce 3 separate Thundercats games – which were all intended to be released as a series. The first in the series was Gargoyle Games’ Thundercats – The Lost Eye of Thundera. Issue 3 of ACE magazine confirmed that there were 3 versions in production – one version being produced in house at Elite (thought to be the 3rd part) and another version which was outsourced (and now known to be Nick and Dave’s game) – thought to be the second game in the series. The game was described as being a 4 way scroller with an exploration element – which fits the description. You can see the snippet scan below. It is very possible that the full title of the game should have been “Thundercats 2 – Beyond The Ice Palace”, but this is to be confirmed. The question is why the Thundercats name was dropped and the title renamed? What happened to the 3rd instalment too? We now await to see if Nick may have anything of the game in its original Thundercats guise. His disks are at his parents, so maybe some day we will get to see the game as it was originally intended. “From what I remember, the game was originally Thundercats which I was really excited about. I used to watch the tv show when I was younger. The first I found that things were otherwise was when various magazines came out with previews of Thundercats and the screenshots weren’t from our game. The story I heard was that Elite had contracted three different teams to do Thundercats. I guess they were desperate to make the Christmas market. They ultimately chose to use another teams version. I certainly remember having real problems with the C64 version. It would randomly lock up ( usually after a couple of hours play ). The bug was REALLY hard to find and turned out to be a strange quirk with raster interrupts which I used to make the game smooth. “A Thundercats game was developed by Elite and I started working on the theme tune which was a “pig” to do using the very basic music routine. Also I found the tune a bit difficult to translate to the c64. It was decided that Rob Hubbard would do the music for this game.. if you listen to the sound track on youtube it is not the thundercats theme but a catchy rob hubbard original composition. Apparently (or so the CPC Press claim) game was intended as an unofficial sequel to Capcom’s Ghosts N Goblins. Ocean doing Target Renegade and Renegade 3. Imagine with The Vindicator aka Green Beret II. I’ll forward over the scans. Cheers Ross! I had seen that article before, but not sure why I didn’t grab it! Thanks for that!